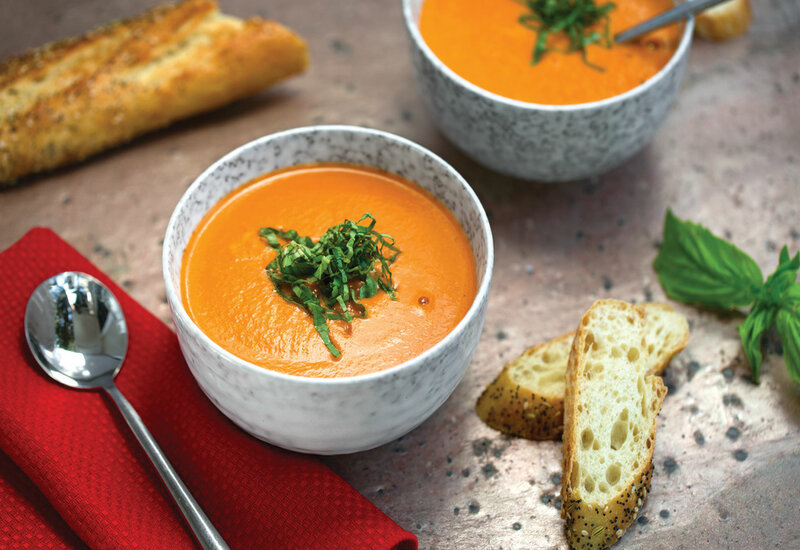 Could there be anything more comforting than a big bowlful of velvety tomato soup? How about a creamy option without a single drop of dairy? Whole cashews are cooked right into the mix, blending to an impossibly luscious consistency. Fire-roasted and sundried tomatoes join forces to lend a robust, full-bodied tomato flavor that tastes like it spent all day simmering on the stove, but only you need to know it needed just a few minutes in the pressure cooker! Everyone will love this vegetarian/vegan soup that is also dairy-free. Cook and stir the onion and garlic in hot oil until softened, about 5 minutes; add salt and continuing cooking until the onions begin to caramelize, about 10 minutes more. Pour vegetable stock into the cooker; add diced tomatoes, sun-dried tomatoes, cashews, red wine vinegar, and black pepper. Blend the soup with an immersion blender until smooth. Ladle soup into bowls and garnish with basil to serve. Be patient while caramelizing the onions. The more golden-brown they get, the more-flavorful your soup will be. Do not rush through this! Per Serving: 124 calories; 7g fat; 12.5g carbohydrates; 4g protein; 0mg cholesterol; 958mg sodium. Used a 14.5-ounce can of fire-roasted and another can of tomatoes with green chiles. It was the BOMB! Of course, I also made grilled cheese for dipping. Everyone thought this was much better than plain ol' tomato soup. I'm not replacing my other recipes, but this one will get some repeat business. This fire roasted tomato soup was delicious. The cashews also gave this it a creamy consistency without actually using dairy. Very simple and easy to make. Amazing soup and it's vegan! Using fire roasted tomatoes makes a huge difference and adds much better flavor. This is my new go to tomato soup recipe. I added some fire roasted bell peppers to this soup as well, it was amazing. I just topped it with crunchy grilled croutons, obsessed. Kid friendly recipe that goes great with a cheesy grilled cheese sandwich. Probably one of the easiest recipes I’ve made. Don’t have an immersion blender but the stand blender worked well. So easy and so good!! I added extra basil to the blender. Will definitely make this often.